About 70% of Indian population still lives in villages. Agriculture and its related cottage industries is the main occupations of the inhabitants of the villagers. Since the times immemorial, the village folks lead a simple life and most of the work is manual. In many areas, the agriculture is dependent on the good weather and timely change in the weather. Most of the populace also rears animals which meet their many needs like milk, milk products like butter, ghee. This means that if the crops are good, and animals are providing articles of the necessity, the rural folk is happy. As a result of this, all these things are revered. Farmer prays to the God, to bless his soil with good crops through rains. The cow which yields milk and endows the farmer with bullocks is highly revered by Hindus. It has been given the rank of mother. As everyone knows that Krishna was a cowherd and you can see pictures in which he is depicted playing a flute and cows gathered around him in love and affection. The arts developed in different regions of rural India are as simple as the folks. For example, the Warli art depicts the simple village life like trees, animals, marriage ceremonies etc. Another such beautiful art is Madhubani or Mithila art. It developed in the village called Mithila, a village in the Bihar. Like Warli paintings the base is again the depiction of the rural life and the rituals observed in the area. In addition to the animals, trees and birds, in most of the paintings, the central theme is the God and Goddesses. Shiva, Sita and Rama are most popular. Sita figures dominantly because of the fact that Sita was the princess of this area. Lakshmi, the Goddess of wealth and prosperity is repeatedly drawn on the floor from the door to the worship room. Many symbols are used to convey the popular beliefs by the artist. For example, fish symbolises the good luck and snakes as our protectors. The paintings on the walls which are plastered with cow dung as wells floors are the part of daily ritual based on the belief that Gods visit the house daily and it is to welcome them that these decorations are done. The painting is done by using natural colors derived from flowers and plants as well rice paste. Womenfolk did all the paintings. The difference from Warli paintings is that no area is left blank in the canvas. After the central figure which occupies the major portion of the space, there are leaves, birds and animals. In contrast to these, in the Warli paintings religious figures are totally missing. 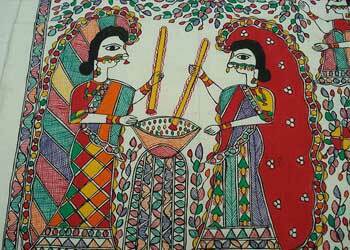 In fact, Madhubani paintings are more evolved than Warli paintings. Both are beautiful in their own way. These paintings are so beautiful that they are in great demand. That is why now the art is made on cloth and paper and graces the homes of well to do in the cities. Many famous artists include Shri Bua Devi Jha, Shri Jagdamba Devi, Shri Sita Devi, Shri Mahasundari Devi and others. 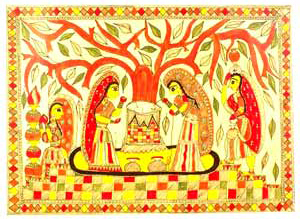 Madhubani painting got official recognition in 1970 when the President of India gave an award to Mrs Jagdamba Devi of Village Jitbarpur near Madhubani. Beside her, two other painters, Mrs Sita Devi and Mrs Mahasundari Devi, were also given national awards in this field. In 2011, Shri Mahasundari Devi was again awarded, this time Padma Shri by the government of India. Here is the Bharti Dayal’s website on Madhubani paintings.